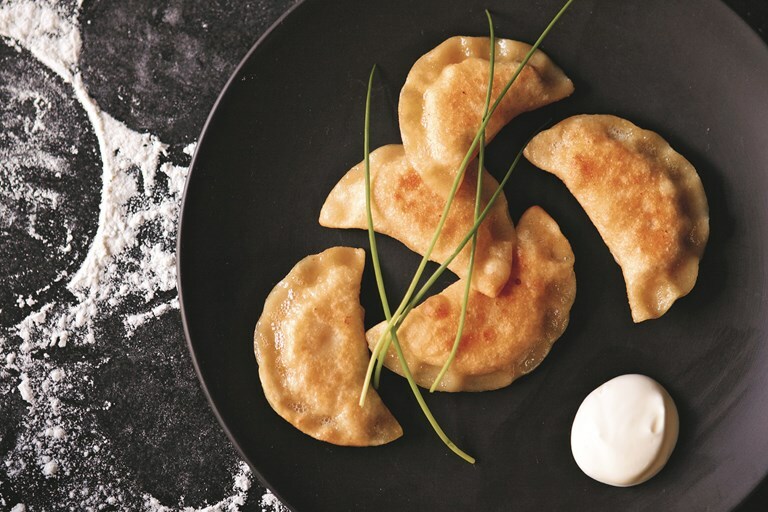 Ren Behan serves up her pierogi ruskie recipe, a wonderfully comforting dish of dumplings stuffed with a cheese and potato filling. Extracted from Wild Honey and Rye by Ren Behan, published by Pavilion. Photographs by Yuki Sugiura. Being Polish and having an insatiable love of pierogi go hand in hand. For me they conjure up images of a big family table, my Mama cooking endless batches and dishing up these little pockets of dough, similar to ravioli, filled with potato and cheese or mushrooms, coated in warm butter and caramelised onions and, sometimes, słonina, a type of pure pork fat. Pierogi can be savoury or sweet – the sweeter versions tend to be made during the summer months with seasonal fruits such as strawberries, blueberries or sweet plums, sprinkled with sugar and served with whipped cream. In Polish, the pierogi filling is called the farsz. Each year, there is a pierogi pilgrimage in Krakow, a huge street food festival where Poles showcase all sorts of flavours and toppings – from the very traditional to the very modern. I’ve eaten pierogi recently at a street food festival in London and from a cart in New York City. The origins of pierogi are hard to trace – they are almost certainly Slavic and there are many variations of them within Polish, Ukrainian, Russian, Lithuanian and Romanian cuisines. In Lithuania they are known as vareniki. In the Ukraine, they are called varenyky: yeast is used for the dough and they are steamed. In Russia, pelmeni are a slightly smaller dumpling. Note that Russian piroshky are usually baked pies rather than boiled dumplings. There are also comparisons to be drawn with Italian ravioli, given that pierogi are made with a simple dough of flour and water and are filled with a variety of fillings, sweet or savoury. They are also almost certainly related to Asian dumplings – Chinese, Mongolian or even Persian. Sometimes, you might find a dough recipe that includes melted butter, or soured cream. My Mama adds an egg yolk, for extra richness. Pierogi Ruskie (originating in the Kresy region of Poland, where my father was born) are made with potato and soft white cheese and are probably the most popular filling you’ll find. Pierogi with wild mushrooms and sauerkraut are often served on Wigilia or Christmas Eve. There are also all kinds of braised meat fillings. I love meat-filled pierogi and have also been known to fill mine with leftover duck and apples. On a recent trip to Poland I visited a pierogarnia – a dedicated pierogi restaurant – near the old town in Warsaw, where I had them with a creamy wild mushroom filling – simply delicious. This is my Mama’s master dough recipe, which makes enough dough for approximately 40 pierogi. They are easier to make in one big batch. If you wish to freeze them, it is best to blanch them very quickly in boiling water, drain and place them flat on a tray so that they don’t stick together. Freeze. Once frozen, they can be placed in a freezer bag. To cook, simply add the frozen pierogi to a big pan of boiling water as below.